Location: Atrium mezzanine, Level 1. Amiens Prison – Fly through the French countryside to the enemy-held prison and blow a hole in the wall to allow members of the Resistance to escape. Based on the legendary Amiens Prison raid of 1944, this mission features terrain modeled exactly after the landscape surrounding Amiens. Norwegian Fiords – Search for enemy battleships in the Norwegian fiords and destroy as many as you can before you run out of time. Test your flight skills and reaction time as the ships return fire. 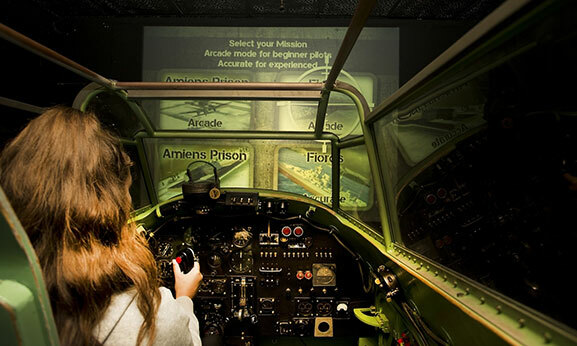 Take some time after your flight to read the information panels in the simulator room and learn all about the amazing aircraft they called “the Wooden Wonder”, and the Kiwis who flew it.